Since its announcement and subsequent debut at Gamescom in late 2015, the Eizo Foris FS2735 gaming monitor has been eagerly anticipated. 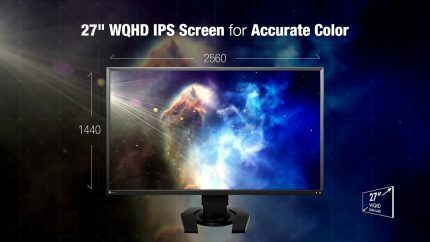 Boasting a resolution of 2560 x 1440 and an incredible refresh rate of 144Hz, this monitor promises a gaming experience like you’ve never experienced before. Say goodbye to blur, screen tearing, washed out colors and ghosting, and say hello to color, contrast, and brightness that’s so rich, you’ll experience your games in ways you never imagined. 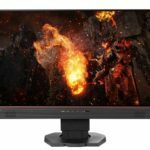 So is this one of the best 144hz monitor for gaming out there right now? We’re about to find out. Japanese manufacturer Eizo hasn’t made many forays into the gaming market. 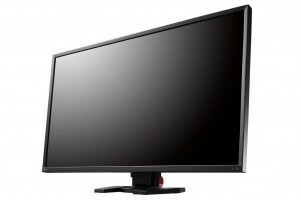 However, take a look at an Eizo Foris FG2421 review, and you’ll see that its 23.5” monitor made a big splash in 2013. This year’s FS2735 eclipses the previous model, offering a monitor that can be used not only for gaming but also any work where high resolution and color clarity are must, such as photography and video editing. If you’re in the market for a gaming monitor, the Eizo FS2735 is certainly one to get excited about. It offers a wide range of connection ports so that you can utilize it with your computer, gaming console, camera and more. In addition to two USB 3.0 ports for your phone and other USB 3.0 devices, you’ll also find the unit comes with a DisplayPort 1.2, two HDMI and a DVI-D. And that’s not all! While the monitor comes with integrated speakers, you also have the option to set up your own unit using either the stereo or headphone inputs. Featuring an IPS panel, the monitor’s aspect ratio is 16:9 while its response time measures around 4ms. The monitor offers over 16.7 million colors and 256 greyscale tones, and its screen features an anti-glare coating. 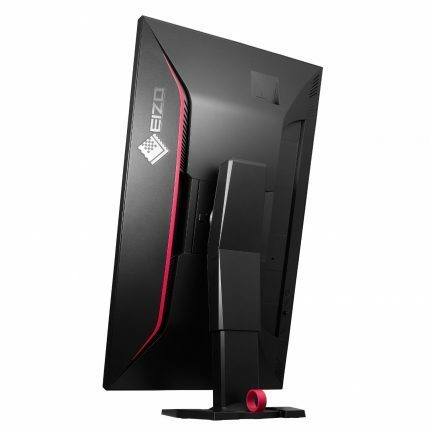 Measuring 27 inches diagonal, the Eizo Foris FS2735 gaming monitor is just the right size for sitting on a desktop or mounting to a wall. Its size is both roomy and compact, and keeps you from having to swing your head around to catch all the action. The bezel on the sides of the monitor measure 14 mm, making it a long way from frameless, but if you are looking to set up multiple monitors, you can still expect a nice experience. Unlike other brands that focus on trying to make big impressions with their looks, the Eizo 2735 features a simple and clean design comprising of a plastic bezel and stand in matte black. On the front, the manufacturer’s logo is small and understated. Next to it, on the bottom right, you’ll find a few indicator lights and nothing more. The screen is semi-glossy and comes with a light anti-glare coating to reduce reflections. The back of the monitor is a bit livelier, featuring a red pinstripe that alludes to the piece’s impressive gaming abilities and the manufacturer’s name in shiny letters at the top. Another flash of red can be spotted in the cable clip at the base of the stand. Aside from these embellishments, the matte black plastic design continues throughout . A handhold under the red accent offers a safe and easy way to carry or move your monitor. Also on the back, you’ll find two 1-watt integrated speakers. While it’s nice to have to have built-in speakers and the opportunity to free up some desk space, the speakers on the Eizo 2735 are as simple as they come.In fact, these are only really suitable for basic sounds. You must put together a nice speaker setup or use gaming headphones for a far better experience. As a gamer, you know how important it is that you have the ability to situate your monitor just right. Eizo thought of you and your needs often when constructing the Foris 2735, and the results are wonderful. Detachable base: The Eizo 2735 features a detachable base that’s removed by pressing a quick-release button. Remove the base when you are transporting the monitor or when you want to mount it to the wall or to a monitor arm. If you prefer to have your monitor on the wall rather than your desk, just use the included VESA mount. In terms of adjustment, the 2735 offers tilt, rotation and height adjustment. The monitor doesn’t offer a swivel function, but the base is small enough and the monitor light enough at just over 15 pounds that you could just move the entire unit with no issues. Tilt Range: The FS2735’s tilt range is 35 degrees up and 5 degrees down. The unit’s height adjustment range is 155 cm, with the monitor’s bottom edge being 30 mm from the top of your desk on its lowest setting and the top extending to 185 mm when the monitor is fully raised. No matter your height, this monitor aims to accommodate, and it does it well. Rotation-wise, the monitor can move 90 degrees to either the left or the right. Formidable screen: The ergonomics of the Eizo Foris FS2735 gaming monitor makes it a formidable screen for all of your shooter and first-person games, the multitude of options also make it an ideal monitor for other tasks, such as photography editing and even watching movies. Adjusting the monitor into the position you prefer isn’t exactly a chore, but the movements are stiff and something you won’t want to mess with often. However, once you’ve picked your ideal placement, you can count on the monitor to hold that setting. Controls: While an Eizo Foris FS2434 review would show that particular monitor’s buttons on the front of the screen where they can be easily accessed, the controls for the FS2735 have been moved to the back. While this does accomplish the job of creating a smooth, sleek look in the front, it does so at the expense of allowing you to see what it is you are actually pushing when you start fiddling with the buttons. On the back of the monitor, on the right-hand side, you’ll find four controls: the power button, two additional buttons, and a joystick. Again, all of these buttons are unlabeled and not viewable from the front, so you’ll be operating blindly when seeking the controls for the on-screen display. To load the on-screen display (OSD), you can press either of the two buttons or the joystick. From there, you can use the joystick to move between options and the buttons to make selections. Whereas all monitors — gaming and otherwise — offer you contrast and brightness options, it should be noted that the Eizo Foris FS2735 gaming monitor takes things further by also presenting you with the option to adjust color temperature, hue, saturation, and gamma. Many monitors give you the chance to play with one or two of these latter settings, but very few give you the freedom to fiddle with them all. One interesting feature that this gaming monitor offers is the ability to tie your smartphone to the monitor itself. 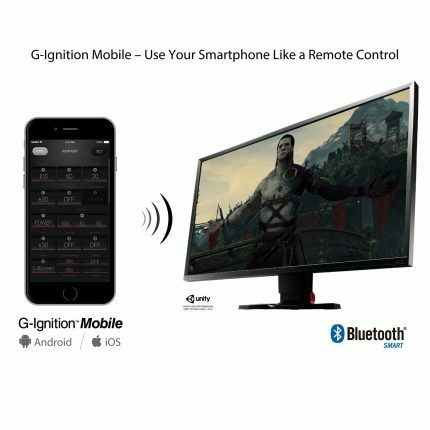 When you connect through Bluetooth and download the G-Ignition app, you’ll have the chance to effectively transform your phone into a remote control for the monitor. Easily access all the of OSD menu options from your phone, and make whatever changes to color, brightness or contrast that you’d like – all without having to reach behind the monitor and play musical chairs with the buttons. 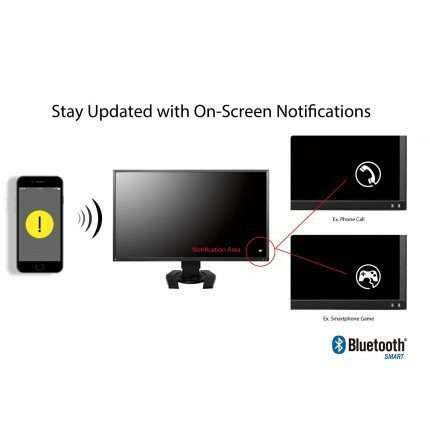 Pairing your phone to the monitor also enables you to receive notifications of incoming calls, texts, and other notifications. This is a handy feature to have if you enjoy playing games with loud sound effects. Whether you’re wearing headphones or blasting the sound from your speakers, you won’t have to worry about whether or not you can hear the phone because all your important (and not-so-important) messages will flash before you. If you are playing fast-paced games that require your full attention, you may find the messages irksome and distracting, so it’s up to you to decide the tradeoff. While on the subject of apps, it’s another service you can take advantage of with the FS2735 is G-Ignition Drive. Using this software, you can download the gaming presets of the professional gamers you admire or upload your own to share with friends. An Eizo Foris FS2434-BK review will show that this is the same service available for use with that monitor and the FG2421. The picture on the Ezio 2735 – in a word – is simply outstanding. Right out of the box, you’ll enjoy incredible contrast, accurate color and just-about-spot-on gamma. There are no other monitors in the class of the 2735 that can offer such results without the need to calibrate. For what it’s worth, even those monitors that should beat the 2735, such as a 4K display, can’t touch this monitor on the above points. This being said, if you plan to use the Ezio 2735 for work, watching movies or light gaming, you can do so without going through calibration. It’s picture clarity really is that good. Should you want to go through the calibration process, you’ll be able to improve a bit on gamma curve, but that’s about it. This monitor really is ready to go right out of the box, which is not something many other monitors can claim. 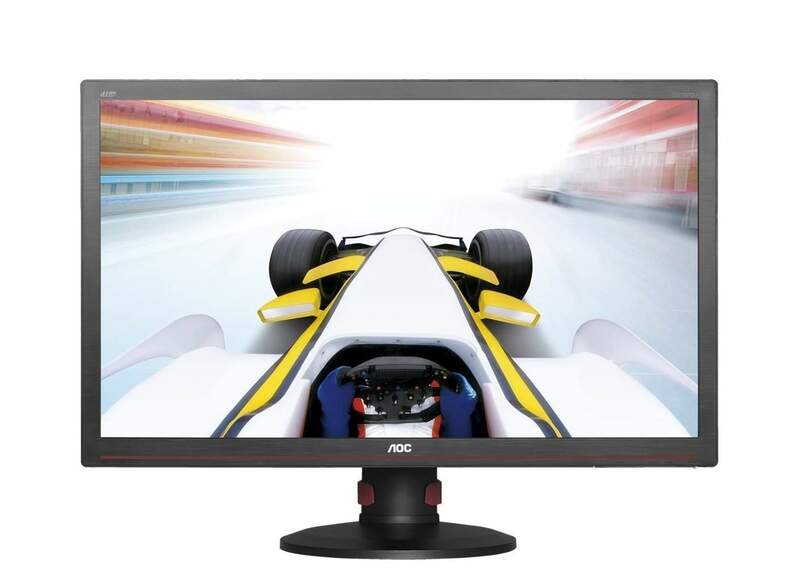 Eizo Foris FreeSync combined with the high refresh rate of this monitor allow for an astonishingly smooth experience and a reduction in screen tearing. While FreeSync doesn’t offer any kind of blur-reduction properties, the Eizo added its own, making this the first monitor to offer both. You won’t be able to use them together due to the way that they operate, but you will be able to go between the two to find out which setting works best for your needs. Other features that contribute to the 2735 presenting the best picture around include Smart Insight Demolition, which improves visibility in both dark and bright areas and the monitor’s flicker-free function, which reduces eye strain. Whereas many other manufacturers only offer a three-year warranty on their monitors, the Eizo Foris FS2735 gaming monitor comes with an impressive five-year guarantee. Both the LCD panel and main body are covered under this warranty, so long as usage time is less than 30,000 hours. Eizo also offers a zero-bright-pixels warranty for six months after purchase, promising no bright subpixels. Dark sub-pixels, which are those that always appear dark against a white background, are not covered. 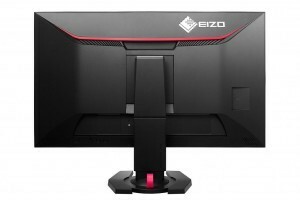 Though the Eizo Foris F22735 gaming monitor is priced higher than most monitors of a similar size and quality, this unit has breathtaking specs and lots of features you won’t find with similar products. It’s the first to support FreeSync and include its own blur-reduction feature, offering a picture quality you just won’t find in any of its competitors. The unit can easily transition from a work monitor to a gaming one: it’s also an ideal choice for projects where color sensitivity and accuracy are very important. If you can get somewhere and have the opportunity to put your hands on this Eizo Foris, test it out and see for yourself just how crisp and clean it is. If not, and you really want the best picture money can buy right now, pick it up anyway. The EIZO FORIS FS2735 is a great 27-inch gaming monitor with a huge amount of features and a stunning display. With FreeSync enabled, you can enjoy a tear-free gaming experience with no stuttering either. The only thing weighing the EIZO FORIS FS2735 down is the hefty price tag compared to other similar monitors.